He continues: “This passing (of) senior men, seventy plus years: grandfathers and great-grandfathers, a great legacy spreading from them. Moss has been there, stayed there, bearing witness to the generations, an epitome of constancy, trusted to witness, to record, to paint, to recount, to be a friend, later a son, finally a posterity for a clan that loses its young. Here is the testament of pain of the survivor, the witness to the raft of the Medusa, that is cut loose, adrift, in all its anarchy; and in its moments of redemptive beauty. The book is everywhere about the power of story, its necessity and its sanctity. Shakey and his brother Brushy disagree over who should go and when (the author suggests a trip to an ancestral site of the Hayes’), and with whom, who’d show me what, and who had the authority to do so. Next thing Brushy, who has conducted his side of the argument from an inverted flour drum next to the fire, stands and delivers a king hit. Shakey throws a feeble retaliatory blow. before a second hit from the more robust Brushy lands him on his seat. Fight finished. Argument decided. Little discussion has transpired. When those few words failed, fists did the talking. Shakey whimpers a little as he regains his feet and wanders off for a pee in the bush. I recoil in horror from what they’ve done to each other and feel guilty…and return to my car. I regret raising the idea. At home a mudlark harasses its reflection in the lounge window. Crows croak over the chicken coop, their tough heads swivel left and right. The phone rings. A friend has a double mattress that someone at Whitegate might like. When I drive out with it to the purple shed, Julie Hayes tells me that she dreamt last night about a bed. ‘More likely you had a dream about someone on it, with you, Julie’, I say. Eva Hayes asks me if I’ll hoick her and Patrick to Amuoonguna. On the bitumen to Ross Highway Patrick admires the height and verdancy of the grass stretching to town on one flank, to Emily Gap on the other. ‘I have no gun,’ I remind him for the umpteenth time. For me ‘One Thousand Cuts’ contained a revelation – the power and penetration of Rod’s photographs. Here are faces and places and events, rendered in archaic black and white. The effect is archival: we gaze at an image and we see history. The photos enlarge upon and comment on the paintings and all the images interact with text. The reader comes closer to Moss and his world – our world – the Australia where whitefellas must still place ourselves. When I look at Moss’ photos of faces, I see ungrinning, uncomplaining veritas – ‘this is how it is, this is how I am’. Xavier Neil, old Arranye, Big Rose and Magdalene Johnson. And Eva Hayes – that unforgettable face of the mother who loses her sons – I look at that face, stolid, ‘sheer as the sea’, and recall the episode in the Bible where the sons of Aharon the high priest enter the Holy of Holies, offer ‘strange fire’ and are consumed in a moment by the conflagration of the Absolute. The text follows – two Hebrew words – va’yidom aharon – and Aharon was silent. These are the photos Rembrandt might have given us. Moss has the Rembrandt eye for character. How does Moss stand it? How can a friend bear the losses, the wantonness? How to reconcile the stone-hard contradictions? After enduring most of the One Thousand Cuts Moss knows he needs healing. On page 198 he sets out on a series of healing trips. To country. With traditional owners. To heal. And he does heal. Country regenerates itself and regenerates the indigenous self, the self to which Moss has been drawn, has moved for three decades. If only I could live in the grace of spontaneity and the elegance of fearlessness. How often do I depend upon their recognition or rejection of me? and bind others to me through my exploitation and fear? At first reading these lines feel at once obscure and clear, a longing, an envious regret, a feeling of the lack of wisdom. Many readings later, they feel the same. The poetics are passionate as Moss strips himself bare. Rod shows himself literally naked in a number of the paintings. The naked artist appears in Expulsion: Once Upon a Time in the Centre, reappears in Reconciliation Walk, as in Eternal Recurrence: the Yard Went on Forever; and in Enigma of the Whiteman. Moss offers images of himself as a curiosity. Like the bull in This is not a Bull, this white Mossfella is a stripped being, surrounded by gazing Blackfellas. Mutely they gaze and wonder, Whitefella, what are you doing here? What are you, here, in the land of the Blackfella? The questions are pertinent, urgent when Moss first arrived, still urgent today. Moss’ images help us to picture ourselves as the Very New Australians we helplessly are. Moss’ two-headed naked self-fighting himself is the Whitefella writ clear, a paradox emerging from a contradiction. At the centre of the volume the reader comes to a section headed, Where Art and Life Collide. In fact this theme underlies the entire work in which paintings, portrait photographs and doublespread landscape photos in blazing colour punctuate the author’s prose, all alternate, illuminate and comment upon each other. Moss anatomises the situation in Alice: What with the extreme weather, the systematic retributive crime, with the rages and ecstasies they induce, the closeness of families, the ready availability of knives and liquor, violence is inevitable. Another Whitefella reviewer has missed the point of these remarks, dismissing them as ‘generalizations’. That point is the inescapable question, universal – that is to say – a general question as much as a particular one: What happens to a human being during these sudden rushes of annihilating strength? A casual browser encountering ‘One Thousand Cuts’ might wonder – is Moss a painter who writes or a writer who paints? The question would be idle. As Moss writes in this section: This unravelling of post-colonial strife is all the more poignant being enacted in an environment of quintessential beauty. The paints, pencils and pens I daily use, what evidence of this do they proclaim? What do they preserve or violate? Has my vision opened, narrowed or deepened? Can some balance be struck through this art I make, something teetering between the beauty and the terror? He hears these sounds – the aircraft, epitome of the shifting, shiftless, impermanent Whitefella; the mice and the pulse, the domestic static of insomnia. Moss knows his country, and, however ambiguously, inhabits it. “Each day I measure myself. 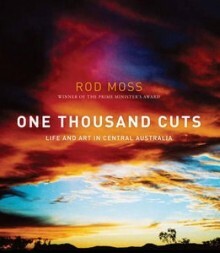 “The Long Weekend in Alice Springs” gets a mention in this beautiful review of Rod Moss’s new book – “One Thousand Cuts”, a book you should have on your bedside table tonight. And I thought it was about the achievements of a mohel on how many britim he has done in one week. Will have to actually read this book.